Aaron Neville: World-renowned singer and unabashed advocate of St. Jude. 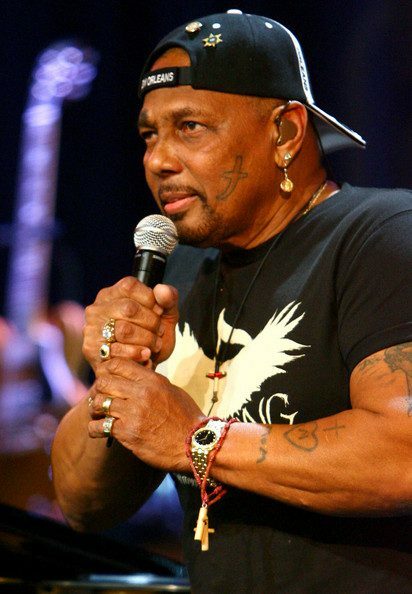 Recently, the GRAMMY-winning singer Aaron Neville, replete with huge biceps and a dagger tattoo on his cheek, attracted parishioners’ stares as he went up to receive Communion from me at Saint Joseph’s Church in Greenwich Village. After Mass I spoke with Mr. Neville and his wife, and told him that I played his version of the “Ave Maria” every Friday at the end of my weekly radio show on Sirius XM 129 at 1 p.m. I also noticed a silver St. Jude medal dangling from his ear and asked him about it. Mr. Neville takes St. Jude to heart. Interestingly, it was the Dominican friars who helped spread devotion to St. Jude of Thaddeus, the patron saint of desperate causes, throughout the United States. In the year 1903 Father Thomas Lorente, O.P., and members of the Spanish Dominican Order came to New Orleans and were asked to take care of the oldest church building in New Orleans, the Mortuary Chapel, now called Our Lady of Guadalupe Church. By 1935, Our Lady of Guadalupe Chapel began a public novena to St. Jude. Since Mr. Neville has publicly credited St. Jude with saving him from heroin addiction, chronic depression, and “slavery-style contracts,” he has become a conduit for others in deep despair. He is not a preacher or a faith healer. He does not pretend to be anything more than a singer, but he has the heart of a friar; and at his concerts he hands out free rope rosary bracelets by the thousands. I gained three important lessons from my encounter with Mr. Neville. First, we all need a mother to help us find God’s grace, and when we pray to Our Blessed Mother she does just that. Secondly, we need to be bold in witnessing our faith, I’m not saying you need to get an earring of Saint Jude, but if your prayers are answered, you are called to share that story with others. Thirdly, never give up! Never give up on anyone or yourself. God loves you and those you love unconditionally. If you have a personal story about St. Jude of Thaddeus write to us, or if you would like to receive a rosary or a third class relic of Saint Jude just send me a note.